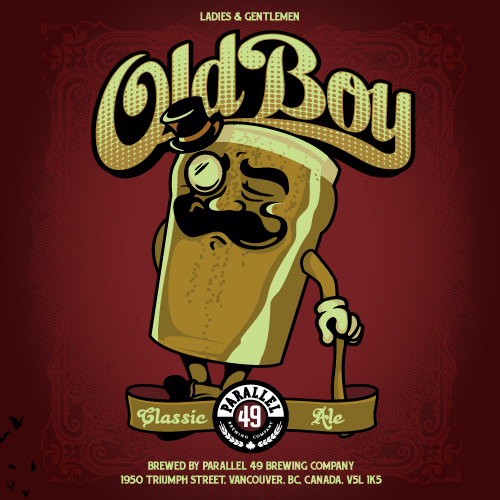 In recent times, I’ve grown quite fond of brown ales, but sadly, the Parallel 49 Old Boy Brown Ale was not one to make my favourites list. The brew just didn’t hit the spot. I was served the beer at The Hub, in New Westminster, as part of a tasting flight. Perhaps it was overshadowed by my enjoyment of fellow samples, Ninkasi Vanilla Oatis Stout and Fuggles and Warlock Destiny IPA. I will say that it’s an easy drinking beer, which might be right up someone else’s alley. The Old Boy is inspired by traditional English brown ales and if provided with another opportunity to try the ale, I probably would. I have to commend Parallel 49 for their label work on this beer and most others in their portfolio. There isn’t much that beats the image of a proud pint, complete with monocle, cane, moustache and top hat. It’s like a boozier version of Mr. Peanut! This entry was posted in BC Beer Baron and tagged BC Craft Beer, Craft Beer, Fuggles and Warlock Destiny IPA, Mr. Peanut, New Westminster, Ninkasi Vanilla Oatis Stout, Old Boy Brown Ale, Parallel 49 Brewing, The Hub by Daniel Wilson. Bookmark the permalink.